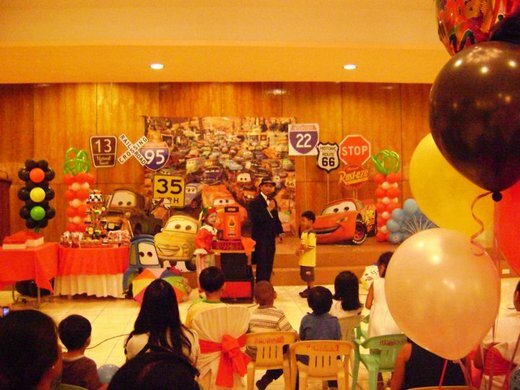 This first party comes straight from the Disney Party Blog. Click here to view the entire party. 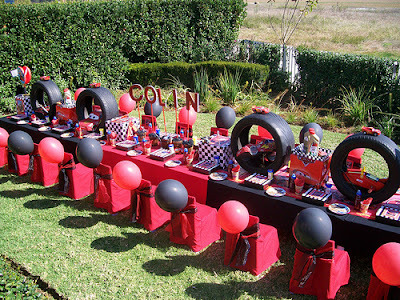 Very cute dessert buffet, all the white and black checkered items is a must....I am thinking some small orange cones and tires would be really cute as well. 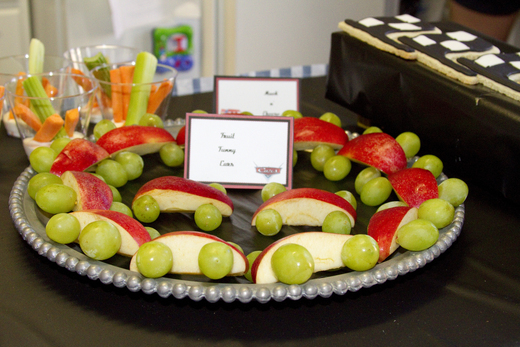 I love seeing fruit at a kids birthday party and when it's as creative as these apple/grape cars, you know the kids are going to love them! On a side note, notice the veggie cups in the background, a very simple, clean way to serve kids veggies and dip. Plus it's fun! Loving the idea of having the kids paint their own car's. To go a cheaper route than buying actual "car's" car's is to simply buys some at the dollar store and let them paint away! 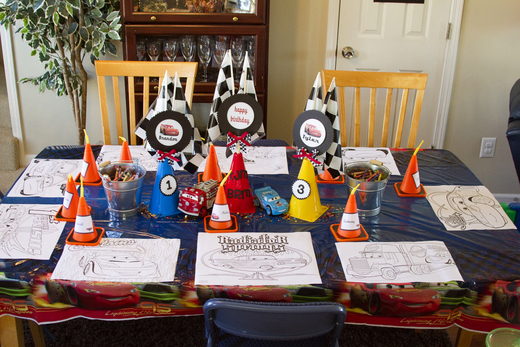 This is what I am talking about - loving the cones as the kids cups! 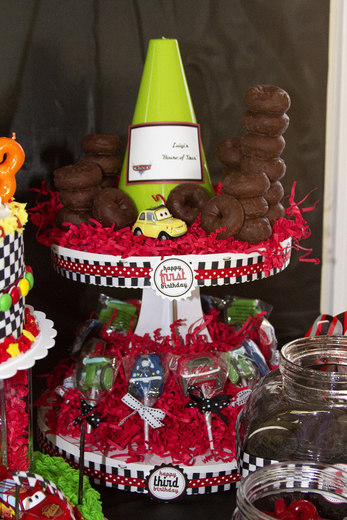 Very cute idea to use mini chocolate donuts as tires! 2. This is another party that was featured on The Disney Blog. Click here for all the details. okay, can I come to this party? 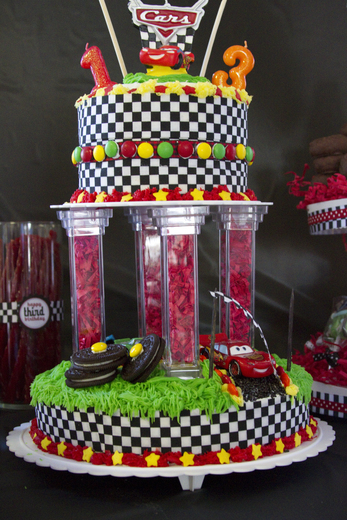 I am not sure it's necessary to get all the car's stand-up's but one would be cool to have at a party! 3. 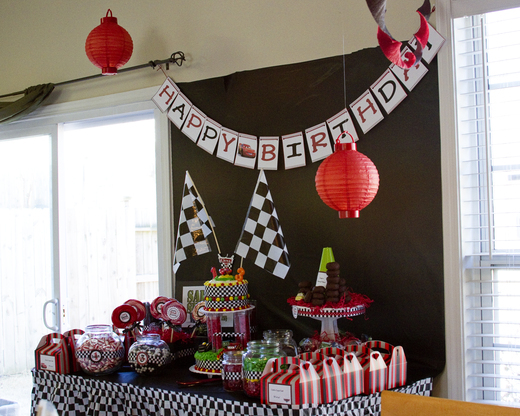 This next party comes from Yvonne Byatt's family fun blog, via Treasures and Tiara's. 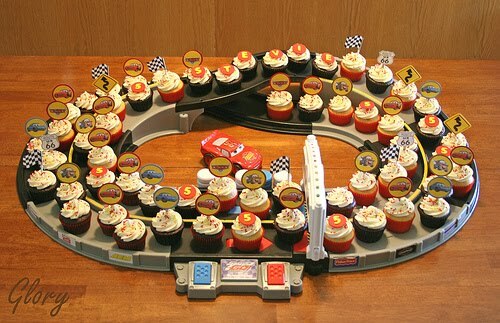 I know this looks overwhelming, but it's very do-able. Just take it apart piece by piece. 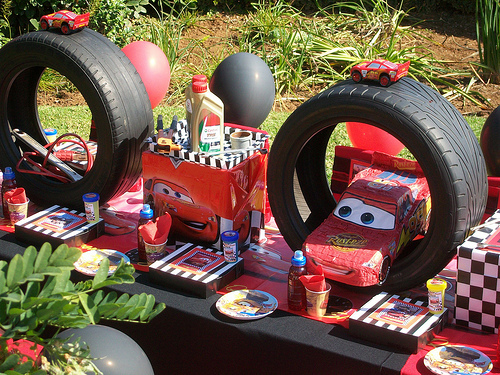 Like the tires, check local auto parts stores for old tires. 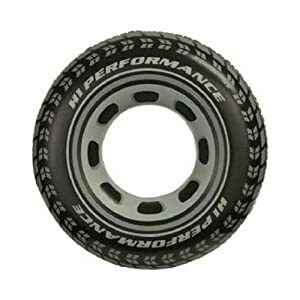 Or you can also buy these inflatable tires as well from amazon. 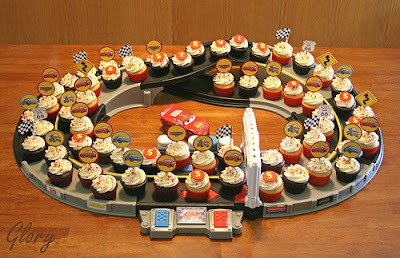 Very cute way to display the cupcakes. Such a cute idea and a fast fix if you need one. You can buy this road tape here. 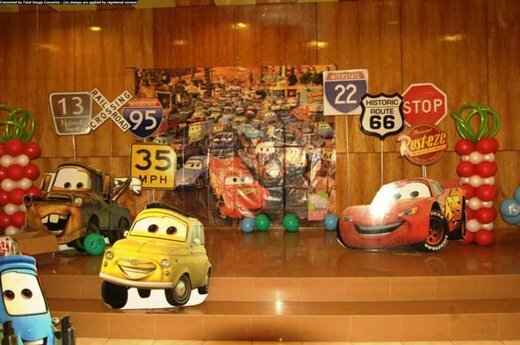 For small kids, use one of these car/road rugs as an activity for the little tykes. 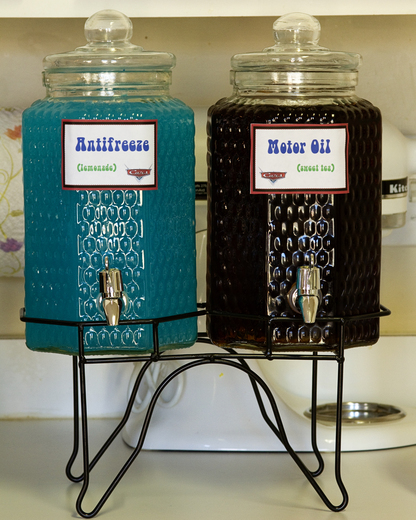 Here is another take on Ramone's paint shop using tattoo's! Now isn't this cute? Rice crispy treats made into stop signs! Yummy! 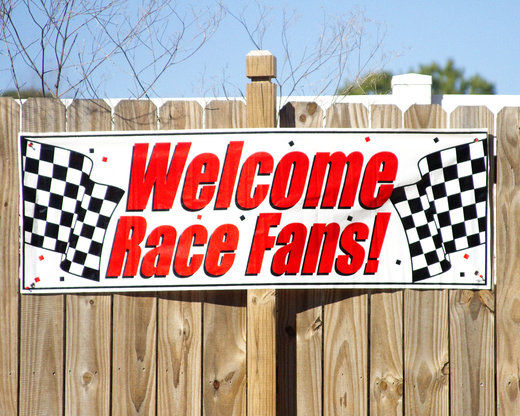 Some other ideas you might want to consider is creating personalized driver's licenses for each guest, or perhaps a lanyard that reads "Pit Crew" with some party info, like your your child's name and how old he is turning and then on the bottom put the name of the individual guest. 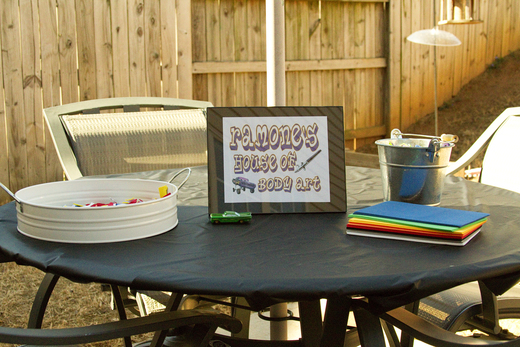 And as always, if you need any help or idea's for a party, just let me know!